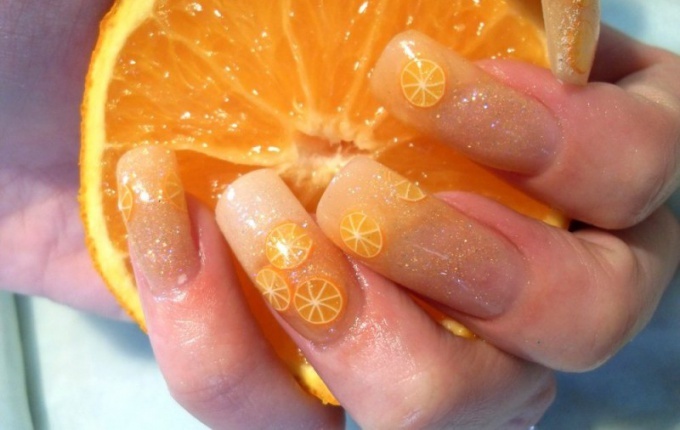 Orange design of nails is especially relevant in summer. You can run it yourself at home. Give the nails the desired shape, remove the cuticle, align the nail plate with a bam. After that, you can start creating a design. There are several ways to create a nail design. The most popular and widely known is painting with colors. Drawing on nails is best acrylic paints on a water basis. First, the density of paint you determine yourself. Secondly, they are easily washed off with water if necessary, if the element does not turn out. Thirdly, they can be purchased at any stationery store. From the tools you will need a thin brush for drawing. For example, a professional stripper (a thin long brush) or a thin brush from nail polish. The latter must first be cleaned from the varnish in a special liquid and shampoo, dried. It will not be superfluous to purchase a flat beveled brush for nail art. It is good to draw some elements. For example, the body of an orange. If the area of ? ?the nail plate is not large, then you can do without this brush. Additionally, you may need a palette to mix the paint to match the optimal consistency, and color saturation. The first strokes are recommended to be done on a sheet of paper to properly place the hand, and to squeeze the brush well. Decide on which nails the design will be located on. In the summer you can afford to make a painting on all your nails. In any other season, one or two fingers adorned with citrus are enough. Consider the composition: background and arrangement of design elements. Effectively and stylishly looks a classic French jacket with a list of orange slices. Equally impressive is the whole composition: several different fruits on one nail. In advance, consider how the orange will be drawn: entirely or in section, lobules or triangles. The most attractive is Citrus in section or its lobe. Much rarer and only as a supplement draw a whole orange. For a lobule or a ring, three basic colors will be required: orange, light yellow, white. It is better not to outline the contour with black paint, but to highlight a more saturated orange color. The lobule is executed quickly: draw a semicircle, paint it. With a fine brush, paint with a yellow paint veins, bones. Outline the outline with a bright color. Draw a circle with a flat beveled or thin brush. Fill it with orange paint. Allow it to dry completely. Light yellow color the veins from the center to the edges of the orange. They should not be perfectly even and clear. Allow them to dry out. Label the outline of the picture in a juicy orange color. The finished design should dry up. Then it can be coated with a colorless varnish or ultra-gloss.